For all of our existing loyal customers and future customers, we have an exciting new offer: We’re giving away this bag made from recycled materials for free with purchases made all this month – so hurry and place your orders for ink cartridges and toner cartridges. Pick from a wide range – HP ink, Epson ink, Lexmark ink, Canon ink, Dell ink, Kodak ink, Brother ink and many other compatible cartridges. 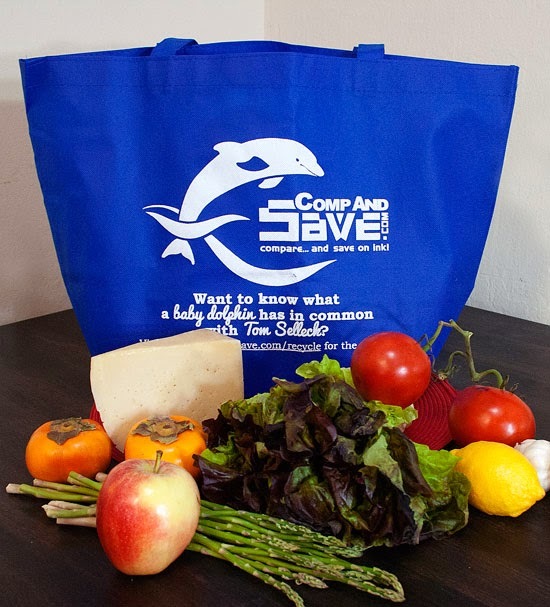 All this November, along with free-shipping, we’re giving away a free Recycled Bag with every order costing $50 or more when you use the coupon code “DOLPHIN” at checkout. 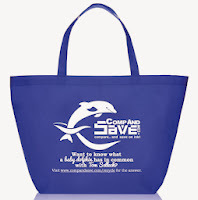 Check out this edition’s trivia question: “Want to know what a baby dolphin has in common with Tom Selleck?” You’ll find the answer to this and future questions at our Recycled Bag Trivia page. We’ve always emphasized the importance of recycling, and as a seller of compatible and remanufactured ink cartridges, we are committed to do our bit for the environment. Our giveaway for November 2013 is just one example of this commitment. 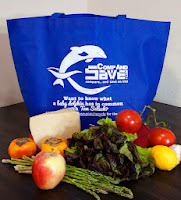 Across the country, it is becoming necessary to bring your own shopping bag to the stores. 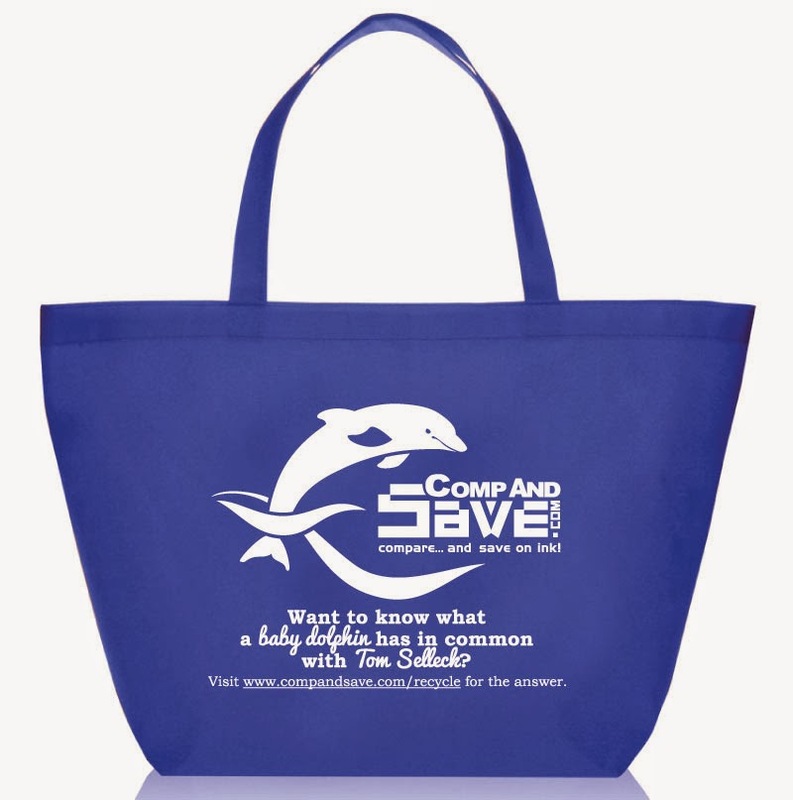 This smart and sturdy tote will help you do your part in reducing your use of disposable plastic bags, making it a great alternative for helping the environment. From time to time, we have many exciting offers for all our valued customers. Currently we’re giving you the chance to win a Gift Card worth $50 when you “Like” Compandsave on Facebook. Liking us on Facebook keeps you up to date with all our new offers, products and events. This can help you keep track of our offers, voucher codes and discounts, so you can take advantage of them as soon as they become available. You can join and connect with more than 20,000 people who currently like us on Facebook. See what they have to say about our products & services, as well as their experiences with orders and deliveries. With our 99% customer satisfaction rate, we are happy to have our customers connect with each other so they can share their positive experiences with CompAndSave.